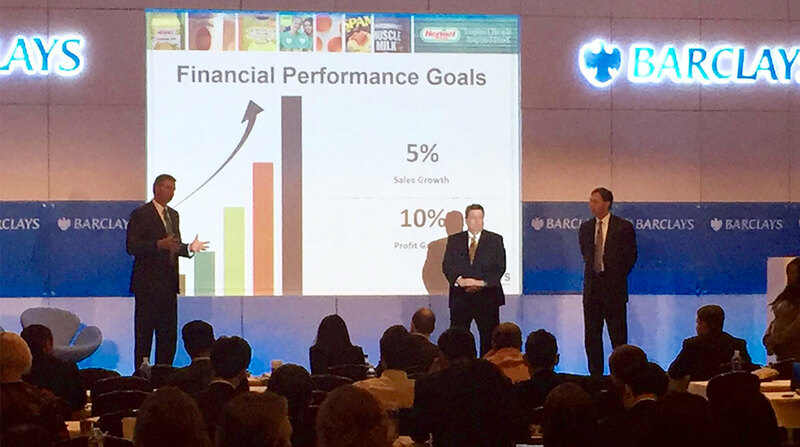 During the Barclays Global Consumer Staples Conference in Boston, Mass., Jeffrey M. Ettinger, chairman of the board and chief executive officer at Hormel Foods Corporation (NYSE: HRL), James P. Snee, president and chief operating officer, and James N. Sheehan, vice president and chief accounting officer, offered insights on the company’s strategies for driving growth, including innovation, leveraging the strength of its balanced portfolio and the success of its recent acquisitions. Ettinger stated his confidence in the company’s ability to meet its growth goals of 5 percent top-line and 10 percent bottom-line in the years to come. During the presentation, Snee reaffirmed the fiscal year 2016 EPS guidance range of $1.60 to $1.64. Sheehan reviewed third quarter results and reiterated confidence in the company’s long-term strategy of investing in innovation and disciplined acquisitions. Hormel Foods celebrates National Hispanic Heritage Month Hormel Foods celebrated National Hispanic Heritage Month with salsa competitions at the company’s World headquarters. Hormel Foods Announces Webcast of Barclays Global Consumer Staples Conference Hormel Foods invites interested parties to listen to the presentation live via the Internet. Hormel Foods Corporation, based in Austin, Minn., is a multinational manufacturer and marketer of consumer-branded food and meat products, many of which are among the best known and trusted in the food industry. Hormel Foods, which leverages its extensive expertise, innovation and high competencies in pork and turkey processing and marketing to bring branded, value-added products to the global marketplace, is celebrating its 125th anniversary in 2016. The company is a member of the Standard & Poor’s (S&P) 500 Index, S&P 500 Dividend Aristocrats, and was named one of “The 100 Best Corporate Citizens” by Corporate Responsibility Magazine for the eighth year in a row. Hormel Foods also received a perfect score on the 2016 Human Rights Campaign Foundation’s Corporate Equality Index, was recognized on the 2016 Best for Vets Employers List by Military Times, and was named one of the 2016 Best Companies for Leaders by Chief Executive magazine. The company enjoys a strong reputation among consumers, retail grocers, foodservice and industrial customers for products highly regarded for quality, taste, nutrition, convenience and value. For more information, visit https://www.hormelfoods.com and http://2015csr.hormelfoods.com/.